Our recent trip to Shimoga will be etched in our memories, not for the famous Jog Falls that we went for, but for the places, we discovered off the beaten track. This trip was special because we learned that not everything can be answered by TripAdvisor or even Google and that the “top things to do” are often subdued beneath the most “popular” (read commercialized) destinations. This post is also special because today I invite my partner in crime, the reluctant writer, Chayan to narrate the story of our weekend wanderlust. Over to Chayan now, and I will see you at the end with a 3-day suggestive itinerary for Shimoga, a lesser known gem in Karnataka(of course I will keep peeking in between). 5th September: It had been quite a few weeks since we had last gone on a road trip – but it felt even more so because my team at the office were going for an offsite and it was an International break in the football season. Sitting at home on a weekend with no football to look forward to is scary and so there I was, trying to plan something else – I knew it was not an extended weekend and we would only have two days of extensive driving and exploring at the same time. So, I had shortlisted two places – Mahabalipuram (near Chennai, Tamil Nadu) and Jog Falls (in Shimoga, Karnataka). It was a contest between the Ocean and the Mountain, and as my wife let me pick, the Mountain won, despite it being a longer drive (and slower given the hilly terrain). This time around though, we had another couple-friend to join us which would act more of an insurance in case I tired (we had to cover about 1100 km in two days). Soon on the same day, the hotel was booked for Saturday night as we eagerly waited for Friday to arrive. Google maps showed that it would take around 8 hours to reach Jog Falls from our place and so we had decided to start earlier than usual – we packed our bags at night, crashed for about 3-4 hours and set off at 3:30 am in the morning. Yours truly was behind the wheel, with my wife in the navigator seat, while our friends decided to catch some much-needed sleep in the back seat. To be fair, the roads in the Southern part of our economically diverse country is more than decent and it wasn’t much of a worry for me. As late risers, we never quite get to witness the sunrise, but thanks to this trip we did as we breezed through NH48. We had packed our breakfast and we stopped at a place where we had a scenic view just a while after sunrise. With another stop for fuel, we reached our first destination, Jog Falls around 11:15 am in the morning but to be fair, it was somewhat underwhelming for me. Given the reputation and the fact that it was just after the monsoon you can’t actually blame me for expecting a little bit more in terms of the volume of water. As some sources have it, there are four different streams of water which merge to form the huge waterfall and we could actually see all four of them scattered in the hills. I can imagine that at peak monsoon, they would actually make a spectacular view, but we didn’t see so. My wife has a different opinion though. According to her the slow plunge from that height in the densely forested mountains had a beauty of its own. 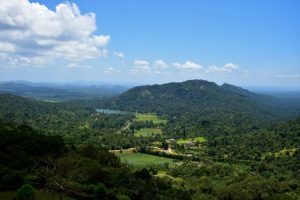 Nevertheless, the place is pretty with a well-maintained viewpoint to walk around and enjoy the scenic hills and quaint little houses. There was a stairway for tourists to reach the base of the waterfall, but like the Shivanasamudram, it had to be closed because of unruly tourists whose actions had caused fatal accidents. So you can’t actually stand at the base and look up at the plunging stream anymore. What I liked was that it was way less crowded than any of the famous waterfalls I have been to and thanks to the restriction we were spared from the unpleasant sight of people doing their month’s laundry at the waterfall. Thankfully we overpacked our sandwiches, which we had for lunch and saved some time in the process. On our way to the hotel which was at the town center of Shimoga, 100 km away we stopped at an ancient temple in Keladi, Rameshwara Temple but yours truly, unwilling to remove his shoes and also little tired at that point, did not venture out of the car. My wife, however, went along with her friends and enjoyed the stone carvings and brilliant architecture. After reaching our hotel, we freshened up and decided to look for nearby places to visit – but it had to be really close as it was nearing sunset. The one name that popped up in our Google Search was Mattur lake which was about 5-6 km away from our hotel and we drove to that place only to find that the view to that lake was obscured by dense vegetation and we had to keep our car on the middle of the road and walk along a somewhat muddy road to even get a glimpse of the lake. As an added bonus, we walked across a bridge across the river Tunga and got a wonderful view of the sunset while asking locals about the lake which seemed unknown even to them. Once back at our hotel, my wife immediately started to plan for the next day, while I grabbed the much-needed rest. It was an ambitious plan – we had quite a few places to cover which meant checking out the hotel as soon as possible. More than that, it was important to choose what to see and what to skip. After careful consideration, we shortlisted Mandagadde bird sanctuary, and the lesser known Kundadri hill-top which had got some great reviews for the temple atop it and the views. The reason for choosing this place over the all-famous Kodachadri or the Kavaledurga fort was that the road to the top was motorable. We wanted to avoid trekking on this trip as we had a long drive ahead and aimed to reach home by 8 pm. People with full-time jobs would appreciate the importance of a good rest on Sunday. We decided to take a rather elaborate route back to Bangalore, as we wanted to go via Chikmagalur, the land of coffee, which offers a scenic road trip through the Western Ghats. We checked out by 9 am before breakfast and were on the way to Kundadri when I spotted the gate to the Gajanur Dam. It was not on our plan but luckily for us it was open and we disembarked to take a look around, as here begins the series of pleasant surprises that awaited us this day. The dam was beyond our expectation and turned out to be one of our top picks for the Shimoga travel guide. Let the pictures speak for themselves here. 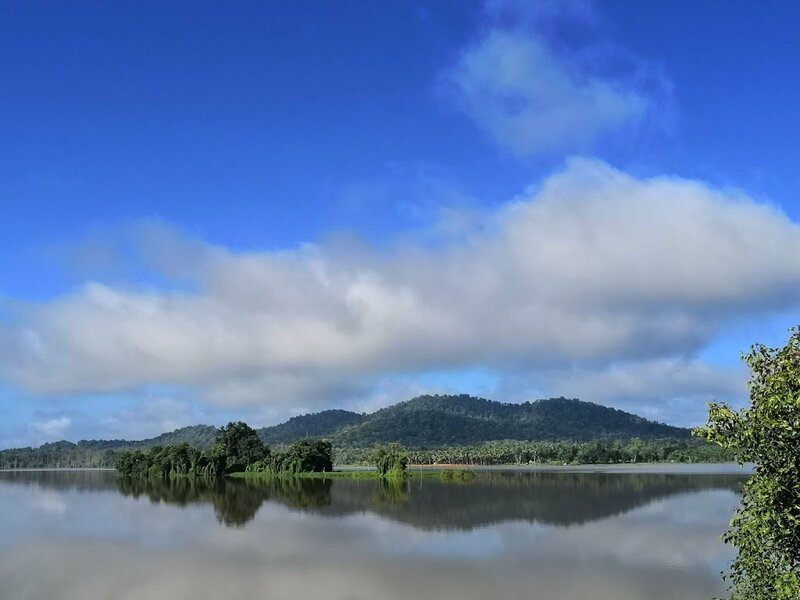 As we moved along to the next stop, which was Mandagadde Bird Sanctuary, the Sakrebailu road hugged the river Tunga for most of the journey and the views at some of the places were breath-taking. There is another highly rated tourist spot along the route itself – Sakrebailu Elephant Camp but we had decided to give it a miss simply because the elephants there are kept in captivity – bound in chains and tourists are allowed to bathe and ride them. My point is if you chain animals to bemuse tourists and you should call it a circus rather than an elephant sanctuary. Coming to the Mandagadde bird sanctuary was a different experience in the sense that in India, most national parks and sanctuaries are drive-throughs and you’d have to be lucky to spot the birds without binoculars. This, however, was a tree-house that offered a fantastic viewpoint of the island in the middle of the river which has a couple of trees where hundreds of birds assemble. The species mainly include cranes, egrets, and cormorants and make a picture-perfect scene under the clear sky. The place has the potential to be a tourist hub with boating opportunity, but as of now, it remains a quiet viewpoint. So, with nothing more to do there, we made our way towards Kundadri. This is when our excitement was at the peak, we decided that we had enough time to trek to Kavaledurga fort, against my wife who was certain that it would be either one or the other between the fort and the temple. The surprises continued throughout the road leading to the Fort had two beautiful lakes on either side and I could not help but stop just to click some pictures. Truly said – “its not so much about the destination, but about the journey”. Kavaledurga also called Bhuvanagiri is one of the oldest forts in Shimoga built in 9th Century Fort by the Nayakas of Keladi when they were under the great Vijayanagara empire. The hike uphill is of moderate difficulty for non-trekkers – it took us almost an hour with multiple stops for photographs. The 360-degree panoramic view of the valley below, with lakes and green fields, is a sight to behold and makes it totally worth the effort. Though the fort is now just a shadow of its former glory, it’s easy to appreciate the architectural marvel with 5 layers of defense. There are three beautiful temples inside. Recent excavations by the archeological survey of India have unearthed the ruins of a palace, courtyard even swimming pools in the area. Love forts? You should surely check out the post about the Best Forts in the World, their stories, where to find them and more. We could have actually driven up to Kundadri had it not been for a thirty-minute detour in wrong direction thanks to poor internet connection and poor sense of direction of a stranger who sanguinely showed us the wrong way. Day1: Do what we did, visit the Jog Falls. Then if you are not done with falls for the day you can visit the Dabbe falls and dam nearby. Otherwise, you can head directly to Sharavati National Park which is located at the town center itself. (It was 1km from our hotel Royal Orchid). Sharavati is less of a national park and more of an extended zoo, an observation I made about Bannerghatta as well. The animals are “free” yet their movement is somewhat restricted.. you would know exactly what I mean if you have been to Bannerghatta. The good thing is you can easily spot lions, tigers and all other exotic carnivores in the (conditioned) natural habitat, while in a real national park, you may drive for hours without a sight of one. Visit timing is between 10 am to 5 pm. Day2: Trek to Kodachadri. It’s a picturesque long trek which is on our bucket list. Day3: Follow our plan above, download offline maps, if possible carry a printout so that you don’t waste your time hovering around in the wrong direction trying to find an internet connection. All year, but for Jog Falls, it’s worth only if you go during the light to heavy monsoon (June- October). 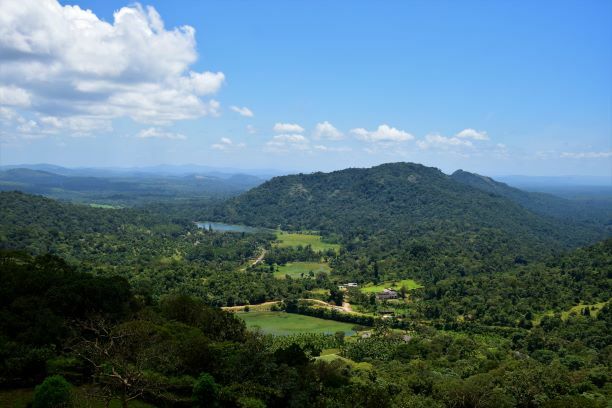 Otherwise, you can simply skip it and enjoy the hills, the sunset at Agumbe, wildlife safari and the perennial lakes. Shimoga is quite cheap when it comes to accommodation. We stayed at what’s reviewed to be the best in Shimoga, Royal Orchid, a 4 -star hotel. It was a good deal at Rs.3400 per night without breakfast. There are many other options in the city center for different budgets, as well as some homestays off the town. You can also book KSRTC cottages at the site of Jog Falls if you plan a little earlier. Those get booked quickly. If you like this, share your friends and subscribe to our blog for your weekly dose of wanderlust! Note: As always, all photographs, watermarked or not, are our own and copyrighted. That was quite a trip and a lot to see. The waterfall is beautiful. Too bad they had to close the path to it, it seems like these tourist who are too "brave" are everywhere. But it was still worth seeing even without it. I never heard of Shimoga much. Thanks for sharing such a comprehensive guide with all details. Assembly of birds at Bird Island is my favorite part of this trip. That was a fully filled weekend visit to Shimoga. It’s so disappointing to get somewhere overly touristy but glad to hear you found great gems along the way. That old fort was impressive and the views beautiful. I am guilty of not having explored Karnataka to the fullest. My travels have been restricted to just Bangalore and Mysore and a couple of towns around them. Jog falls has been on my list since I learnt about it in my school text books..haha.It is always nice to explore the unexplored and hope to catch up on this itinerary someday! So glad you were able to stray from your original itinerary somewhat and be a little impulsive. Sometimes that is the best part of making a road trip — taking advantage of what you discover! Truly beautiful photos, and a great itinerary! Waterfalls and forts in Shimonga seems like the perfect combination of things to do. Road trips are great for discovery. Wow, less traveled roads give great surprises. I have been to Karnataka but didn't have enough time to visit it all. A beautiful travel post. Great description and wonderful photography. Loved it. I can see what you meant about Jog Falls being quite underwhelming. Still nice to see though, but the rest of your journey was incredibly beautiful! My favorite part is that the bird sanctuary is a treehouse / lookout where you can actually see the birds! Least favorite part of this was the poor elephants and I’m glad you didn’t contribute to the problem! It’s nice to know that for the most part the roads are easily drivable, and mapping before heading out is definitely a good idea! I thought I explored Karnataka but never got the chance to visit this place. I heard about Shimoga before but unfortunately didn't have the time to visit during my last Karnataka trip. It’s good to hear that most of the road leading there is easily drivable. After reading this lovely piece, I definitely have to come back. 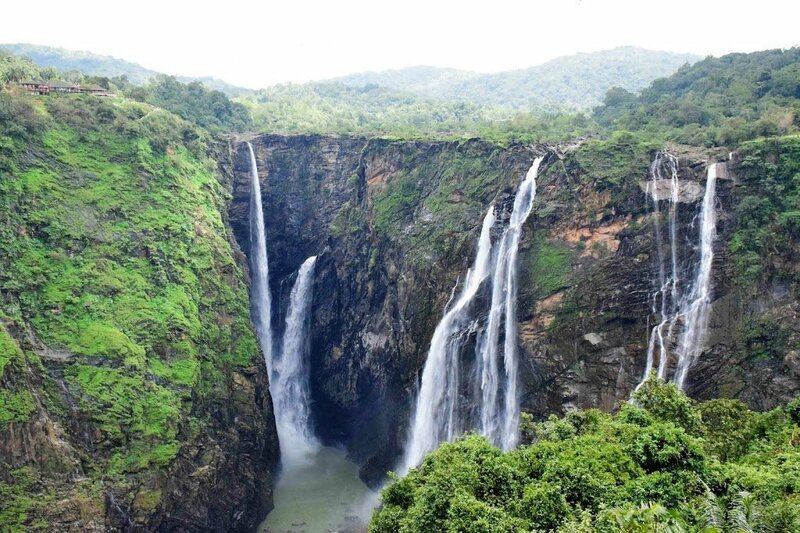 Jog Falls is beautiful – I had not heard of it before! Thanks for sharing this quick roadtrip. It would be perfect for a long weekend. I love hearing about short weekends away full of adventure! Sometimes life doesn’t allow for extended trips, but so much can be gained from short ones too. The temple is beautiful as are the views of Jog Falls. Waterfalls are my weakness! Thanks for sharing the details for a quick road trip around this area! All of the waterfalls at Jog Falls seem surreal! Gajanur Dam sounds like it was surprisingly wonderful as well! I love it When we find a travel spot off the beaten path. We once found an abandoned beach on Oahu, Hawaii and it was the highlight of our trip. Looks like a nice weekend getaway. Have been on many such short trips from Delhi, but need to explore Karnataka and Kerala now. A trip to Shimoga has it all, from panoramic views to beautiful drives to adventurous waterfalls. Definitely my kinda weekend getaway.